BlogHome » Blog » So, graduation! A Translator? And, then what? Raluca-Maria’s Story! Summer of 1986.My dad decided to teach me English. Romania was a communist country at the time and they didn’t teach English in all schools, so this was the only way. I started to like it more and more, and I learned more, year after year. I read books, listened to music (my love for English and for good music have grown hand in hand). I had a fantastic secondary school teacher of Romanian language, who (along with my parents) cultivated my love for words and good literature. I also had a wonderful high school teacher of French- it’s to her that I owe most of the French that I (still) speak. Fast forward to University years. In 1999, I did not enroll with the Faculty of Foreign Languages and Literature, but with the one of Psychology and Sciences of Education. Back then, I wanted to be a psychotherapist. It didn’t happen (I realized, eventually, that it wasn’t what I wanted) but I’ve kept a vivid interest in the field. Moreover, what I learned then helps me a great deal when I work in training events, which happensquite often. During and after my BA studies, I had several jobs, some of which involved translation and even interpreting (well, not quite “the real deal”, but some sort of liaison) andI liked them both. In 2005 I decided to enroll with the European Master for Conference Interpreters, recently established at the University of Bucharest. What followed was a wonderful (and not always easy) experience that made me fall in love deeply with this profession. We had intensive courses of consecutive and simultaneous interpretation and not only (translation, etc. ).I loved it, but I still wasn’t sure I was cut out for it. At some point, halfway through my MA studies, I was about to ask one of our professors if I should go on with my studies. As if she had read my mind, she told me that yes, I should; there was more to learn but I should definitely not quit. I will always be grateful to her for that moment. – Wonderful as my job was, I had always known that I wanted to be on my own. I realized I couldn’t progress any further where I was, and that I had “grown” enough to move on. At the end of 2010, I decided to become a full-time freelance interpreter and translator.By that time, I already had some freelance clients, so I thought I’d take it from there. I also received an offer to be an Associate Teaching Assistant for the Conference Interpreters’ course at the recently-established Department for Translators and Interpreters;it complements my main occupation very well. Every now and again, I am asked whether I regret becoming a freelancer. Never. It was the best decision for me. Because I did it only when I felt I was mature enough for another, different challenge. I have learned a lot in the past 3 years, and, I am sure, I will continue to learn. Every new event brings along a different venue and setting, different speakers,differentcolleagues, different challenges. I also translate, mostly texts related to the events where I get to interpret (I think this approach is good bothfor the outcome of the event and for myself), but not only – I am always willing to take on separate translation assignments as well. And there is one more thing I love about freelancing: I’ve met (in person and virtually) so many fantasticcolleagues, with whom I have either worked in the booth or in larger translation projects, or talked about our profession, or just read their websites and blogs and I’ve learnedso much from them. One of these colleagues is Konstantina, whom I would like to thank for inviting me to publish on her blog and for waiting for me togather my courageand write the first piece ever about myself. Raluca Maria Topala has worked for more than 10 years in the field of language services (full-time for the past 7 years and freelance for the past 3), specializing as a conference interpreter (English ‹›Romanian)and translator for business and legal documents. She has a MA Diploma in Conference Interpreting and is currently enrolled in a PhD Programme in the field of Translation Studies. She is based in Bucharest, but she’s willing (and happy) to travel for professional assignments. 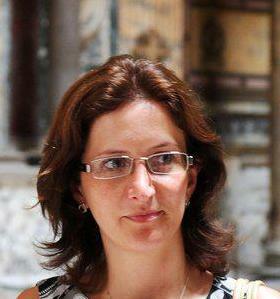 She can be contacted at office@raluca-topala.com or via LinkedIn, Google+ or Twitter. I loved your story, Raluca. Another interesting thing to learn about you. I think it’s high time you had a blog as well, don’t you agree? You write really well and I’m sure that there are people interested in reading what you have to say (I’m definitely one of them). So…? Thanks , Alina! Yes, I think I’ve managed quite a performance – to guest-blog without being a blogger myself:) I’ll probably do it, sometimes, when I learn how to take less than 3 months to write a page and a half:) On a more serious note, I think blogging takes a sort of discipline and a series of other qualities, which I am not sure I have (yet). This really is most impressive! I liked your story and agree that you should have a blog – and take the opportunity to visit my blog at http://www.paul-translator.blogspot.com. I translate English to Portuguese and am based in São Paulo, Brazil. @Donald Rutherford – Thank you! It was a good experience for me to look back at all those moments, those little turning points, those decisions that have influenced my professional life. @Paul W Dixon – Thank you for the encouragement and for the link – very interesting blog! I will probably, at some point, have my own blog. (Perhaps it would be a good idea to learn how to proofread my own texts in the mean time:) Guest-blogging was certainly an interesting experience, for which I would like to thank Konstantina once more. It was a pleasure, Raluca! Such stories need to be told! Have a great week! Going through your story was really a nice experience Raluca. I like the way you pen down your memorable moments. Just keep writing.